Staten Island is situated at the entrance to New York harbour. The island is 14 miles long and 7 miles wide. 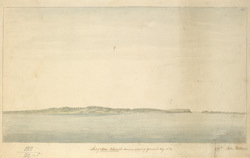 As can be seen from this watercolour, in the 18th century the landscape of the island was varied with steep hills and thick woodland. The island was divided in to 166 small farms and two large estates, with Richmond town becoming the administrative centre. Later in the 19th century Staten Island became a popular retreat for wealthy residents of New York city and large built houses and estates were built around the shores.